In the currency market, so-called lots, mini lots and micro-lots are bought and sold. 1 micro lot is equivalent to 1’000 of base currency and in the volume field of MT4 it is expressed with 0.01. 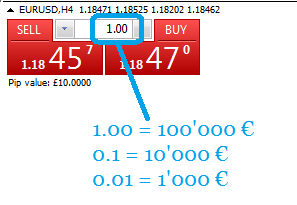 Since forex is a very liquid market and most traders who operate there keep their operations open only for a short period of time, the broker gives the possibility to buy / sell a certain amount even if he does not actually have it on the account, requesting only a deposit to guarantee the operation called margin in MT4. 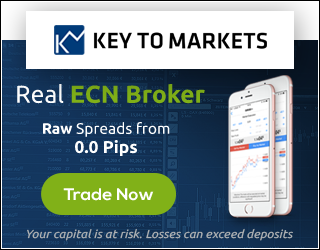 With a brief example, through leverage you can buy 1 whole lot of Euro / Dollar (100 thousand euros) with just over 200 euros of deposit on a trading account with a leverage of 1: 500, the difference is lent by the broker. These € 500 are “blocked” money to guarantee the € 100,000 transaction. Where do I find how much money is used as a margin in the MT4? window and, precisely, in the last gray line. automatically trigger the Stop Out mechanism and close the transaction with the highest loss. What is the stop out? operations is going to erode the capital put into deposit of the same operations). The Metatrader 4 has a system that warns traders when the free margin is about to reach zero. This warning is called “Margin Call” and is activated when the margin level reaches 120%. from triggering the Stop Out and closing the operations automatically. What is the “margin level” and the “margin call”? risk of exhaustion of the available margin and consequent Stop Out. The lower this value decreases, the higher the risk of Stop Out. operation bar will become red. The difference between the leverage used and the account leverage. much it buys / sells but only what is required for margin. Amount bought / money on the account. € 100,000 / € 1000 = 100 leverage used.